Instructions: Cut a piece of white cardstock to 12 x 6" size, score and fold at 6" to create card base. Cut a 6 x 6" patterned panel from the Cherry Blossom Retreat paper collection to 5 7/8" square. Lightly sponge edges with Rose Madder ink and attach onto card base. Diecut the decorative Daydreams Bridge die from white cardstock. Use the Tool N' One to remove small excess paper pieces from the decorative diecut. Use double dots to attach onto center of card. Stamp the 'Just for You' in Leaf Green onto white cardstock and diecut with arrow from Arrow and Banners die. Trim off part of the arrow as shown. Sponge edges with Rose Madder ink and attach onto top right corner of card. Stamp the birdies from HCPC-3866 Tweet Cherry Blossoms, right facing leafy branch and birdhouse from HCPC-3867 Cherry Blossom Retreat Cling Stamp Set in Archival Black ink onto white cardstock and diecut with coordinating dies. Stamp medium 1x and small cherry blossoms 2x from HCPC-3866 Tweet Cherry Blossoms Stamp Set in the Black ink onto white cardstock and diecut with coordinating dies. Use the Stack and Store daubers to color the images. Color the edges of cherry blossoms with Rose Bud ink, shading darker on the edges and softly in the centers. Use Sky Blue ink on the top of baby birdies' bodies and Rose Bud ink on the bellies. For the birdhouse, use Peanut Brittle ink. Use Leaf Green on the leafy branch and leaves. Use the stylus from the HCST1-401 Deluxe Flower shaping kit to shape the birdhouse and branch. Place the cherry blossoms and birdies into the HCFB1-474 3D Cherry Blossom Shaping Mold, lightly mist with water and send through die cutting machine. You will need 2 of the baby birdies, 3 medium, and 9 small cherry blossoms for this card. Use glue and double dots to attach leafy branch and birdhouse onto card. Attach blossoms and baby birdies onto card as pictured. Use the Dries Clear glue along with Crystal glitter to add a touch of sparkle over blossoms, leaves and rest of card as desired. 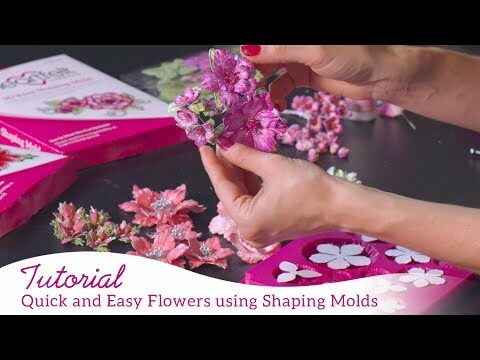 Use the same glue to add Go Man Go prills to the center of blossoms.